[Alexander Campbell Fraser, Scottish philosopher.] Autograph Letter Signed ('A. Campbell Fraser') to 'Miss Alice', expressing pleasure at her request for his autograph, 'inartistic & illegible as it is'. On letterhead of Gorton, Hawthornden, Midlothian, N.B. [Scotland] 6 October 1893. [Lovat Fraser, editor of The Times of India.] 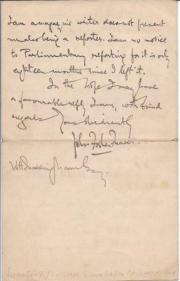 Autograph Letter Signed ('Lovat Fraser') to the news editor of the Daily Mail, sending 'something short' regarding 'Lord Hardinge's arrival' (having served as Viceroy of India). On letterhead of the White House, Slough. 23 April 1916. 1p., 12mo. In fair condition, on lightly-aged paper, with traces of brown--paper mount adhering to blank reverse. He is sending, at 'Mr Marlowe's request, [...] something short to be added to your announcement of Lord Hardinge's arrival' (not present). He realises that 'space is limited', so he has 'made a brief catalogue of his principal doings'. He ends by asking for the piece to be anonymous. Typed 'Confidential Report' by Charles E. Fraser, Chief Photographer, on 'Subject: Comprehensive Photographic Record for posterity of the South Bank Exhibition Festival of Britain 1951', with 'Estimated Cost of Photographic Record Operation'. [Festival of Britain, London.] 4 August 1951. 4pp., 8vo. Stapled. Carbon of original typescript, with indentations showing on the reverse. In good condition, on lightly-aged paper, with rust spotting from staple, and punch holes in margin. The report covers the first three pages, and is dated at the end '4th August, 1951'. It is headed 'Charles E. Fraser, Chief Photographer, Lennox Gardens | Director of Exhibitions | Confidential Report | Subject: Comprehensive Photographic Record for posterity of the South Bank Exhibition Festival of Britain 1951'. [Two printed volumes, with the second volume containing memoranda on the corps by Major Thomas Fraser King.] Incidents and Anecdotes in the Life of Lieut.-General Sprot, Honorary Colonel of the Princess Louise's Argyll and Sutherland Highlanders. Printed for private circulation only. [Edinburgh: Gordon Wilson, Printer, 47 Thistle Street.] Vol. 1, 1906; vol. 2, 1907. 2 vols, 8vo. Vol.1 (1906):  + 106 +  + 17. Vol.2 (1907):  + 97pp. Both volumes with frontispieces and several plates. Both in original red cloth bindings with Sprot's crest in gilt on front board, and all edges gilt. Both in fair condition, on lightly-aged paper, and with the first volume (despite slight damp staining to the binding and damage to one plate) better and brighter than the second, which has wear at the foot of the spine. 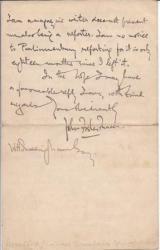 Autograph Letter Signed ('John Foster Fraser') from the English travel writer Sir John Foster Fraser to H. W. Massingham of the Daily Chronicle, describing his career and qualifications while applying for journalistic work. 3 January 1896; The Author's Club, 3 Whitehall Court, SW, London. 12mo, 4 pp. 61 lines. Text clear and complete. Good, on lightly-aged paper. An impressive letter applying for work. He does not expect Massingham (addressed as 'W. H. Massingham') to remember their meeting 'in the Lobby' when he was 'chief reporter on The Sun', while at the same time holding 'a Parliamentary engagement on the staff of the C. N.' Gives details of his subsequent employment, including joining the editorial staff of the 'Manchester Guardian' ('principally to look after their weekly paper which was in a sad way. Manuscript Minute Book of the Oxford Ornithological Society, with signatures, covering the period between 1943 and 1948, and with a number of attractive handbills and other items of ephemera (printed at the Oxford University Press) tipped in. [Oxford.] Michaelmas Term, 1943 - Michaelmas Term 1948. 4to, 180 pp. In original 'Emberlin & Son' ledger, with red leather half-binding, black cloth, marbled endpapers. Text clear and complete. In fair condition, on aged paper, in worn binding. Minutes signed by G. H. Spray, B. W. Tucker, W. B. Alexander, J. B. E. Say, William G. Dyson, Alan Newton. Numerous programmes (with lists of officers) tipped-in, along with one set of rules and a poster with large engraving of bird (a smaller version of which features on the programmes), printed by the Holywell Press. 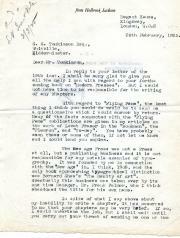 Typed Letter Signed ('Holbrook Jackson') to G. S. Tomkinson of Whitville, Kidderminster. 26 February 1925; Regent House, Kingsway, London, W.C.2. 8vo: 2 pp. 32 lines of text. Good, on lightly-aged paper. He is willing to help Tomkinson with his book 'Modern Presses', but would not 'have time to be responsible for the writing of any chapters'. Offers to answer 'a questionnaire' regarding 'Flying Fame', and directs Jackson to his 'articles on the work of Lovat Fraser in the "Bookman", the "Fleuron", and "To-day".' 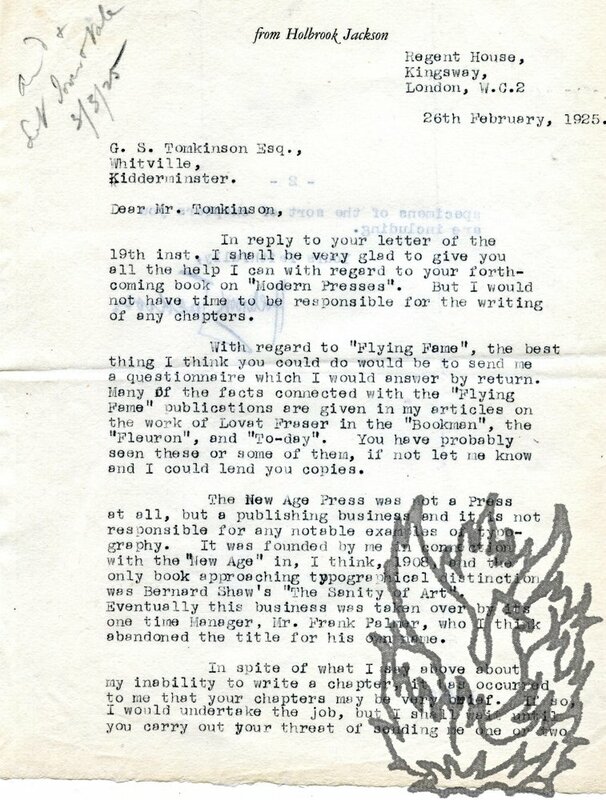 Paragraph discusses the 'New Age Press', which 'was not a Press at all, but a publishing business'. In the last paragraph changes his mind, and offers to write a brief chapter. List of publications 'At the Sign of Flying Fame' in the form of a handbill. Printed on pink [faded from red?] unwatermarked paper, with cream backing. Dimensions of paper roughly fourteen centimeters by thirty-three centimeters. A frail ephemeral item. Lightly creased, and with further creasing and closed tears at head and foot, and minor loss at head. Faded, and with further fading at head. Headed 'At the Sign of Flying Fame.' Illustration by Lovat Fraser of mounted seventeenth-century man blowing bugle over cityscape. 'LIST OF PUBLICATIONS' includes details of six broadsides and four chap-books. Announcement by "Hardwicke C.", Lord Chancellor. One page, c.6.5 x 4.5", verso blank, right edge irregular (extracted? ), small tear, sl.ightly marked, good condition. "In pursuance of an Order of the House of Peers, of the Nineteenth Day of March 1746, I do appoint SAMUEL BILLINGSLEY to Print the whole Proceedings in the House of Peers, upon the Impeachment exhibited by the Knights, Citizens, and Burgesses, in Parliament assembled, in the Names of Themselves, and of all the Commons of Great Britain, against Simon Lord Lovat, for High Treason; And do forbid any other Person to Print the same. / Hardwicke C."
Albert Rutherston: A Catalogue of the Illustrated Books, Periodicals, Pamphlets, Christmas Cards, Pantomimes, Diaries and Almanacks, Pattern Papers, Ornaments and Autographed Letters in the Collections of Manchester Polytechnic Library. Manchester: Manchester Polytechnic Library, 1988. Quarto: ix + 21 pages. Stapled. In original cream wraps, with colour cover illustration by Helen Taylor. Full-page reproduction of drawing of Rutherston by his brother Sir William Rothenstein. Introduction places Rutherston in the tradition of Edward Gordon Craig and Claud Lovat Fraser. Copies of the second edition (1992) recorded by COPAC, but not at BL or Bodley. A garland of new songs by L. F.
Eight pages, 12mo. Unbound and unstitched. Unfolds into a single leaf. Paper watermarked 'OAKWOOD | FINE VELLUM'. Five different illustrations (one of which is duplicated). Grubby, spotted and with small closed tears and fraying along one edge (not affecting text or illustrations). 'PRICE FOURPENCE PLAIN; SIXPENCE COLOURED.' This copy is uncoloured. Eight pages, 12mo. Unbound and unstitched. Unfolds into a single leaf. Paper watermarked 'OAKWOOD | FINE VELLUM'. Three illustrations. Good, but paper slightly discoloured and with some spotting. 'PRICE 2 PENCE PLAIN, 4 PENCE COLOURED.' This copy is uncoloured. Illustrated handbill for two of his publications. Without date or place .